You should find out which are the least invasive, most effective surgical treatments available for your condition. At Desert West Surgery, we are proud to share that we offer the Davinci Robotic Surgery System for the treatment of serious medical conditions. 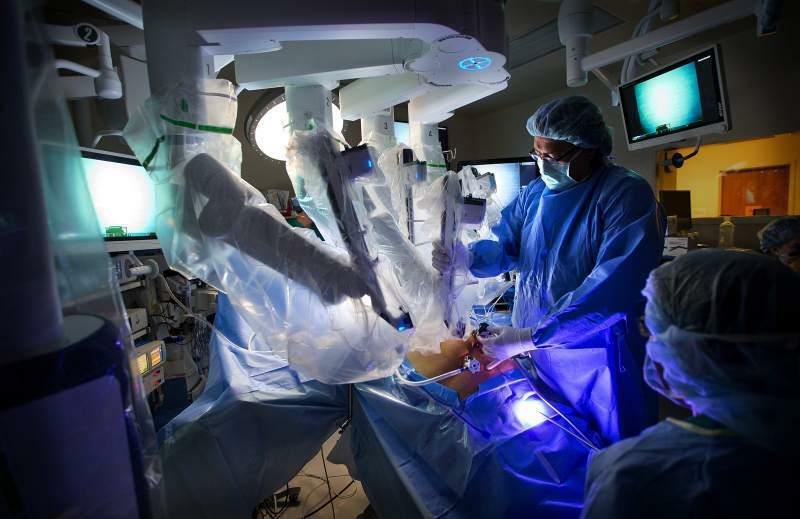 The robot used in the Davinci System has four “arms” which play an important role in the surgical procedure. One arm holds a high-definition camera, or endoscope, while the other three arms control miniaturized instruments corresponding to incisions in the body of the patient. Seated at the console, the surgeon remotely inserts the HD endoscope as well as surgical instruments into the patient’s body and moves them through the robot arms using the hand controls and foot pedals. This surgery system provides patients with a significantly shorter recovery period. It is minimally invasive, which means that blood loss is reduced. There is also less scarring with this robotic surgery system. Patients are able to return to work and their other everyday activities faster. In many cases, this system provides better clinical results. While known as a “robot”, the Davinci System is in truth an extension of the surgeon. It is a state-of-the-art tool that ensures that it makes most of the skill and expertise of the surgeon performing the procedure. The surgeon’s dexterity is significantly enhanced and allows them to get as close to the surgical site as necessary, ensuring that the affected organ or area is successfully operated on. This is why we at Desert West choose the Davinci Robotic Surgery System for a range of surgical treatments. When you are in need of high-quality medical treatment or surgery, there is one name you can trust for the best – Desert West Surgery. This is where you will find skilled and experienced professionals to provide you with quality care and medical service for all types of illnesses and conditions. We have the training, fortitude, and technologies to handle all your medical needs. Get in touch with us at www.desertwestsurgery.com for unmatched medical treatment and surgical abilities.